I was meeting two friends I lived with in Spain, so it was a bit of an adventure getting up there from my house. 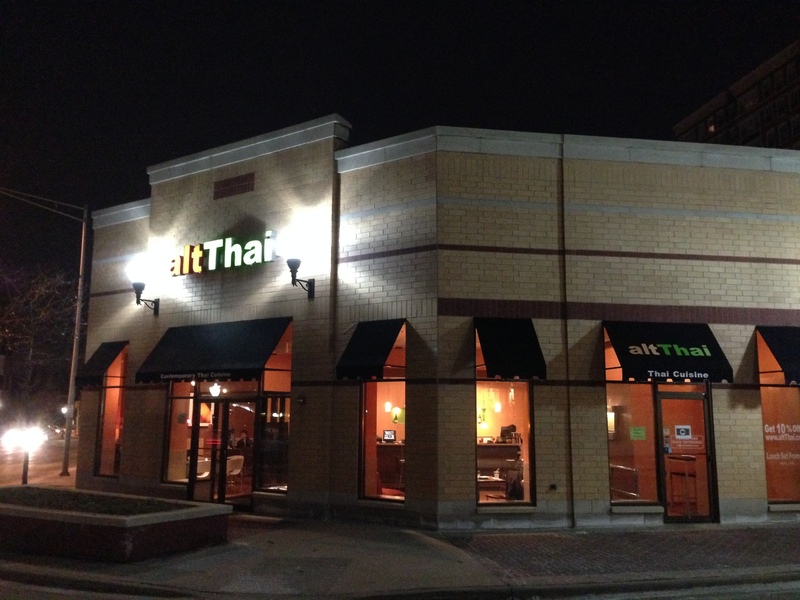 Thankfully, there is a parking garage nearby as this restaurant doesn’t have a parking lot or street parking. Upon entering the establishment, I noticed it was minimally furnished with Thai artifacts and painted with warm hues that reflected the amiability of the Thai people. Little did I know that our waitress would be quite the opposite. She immediately was hustling us to order drinks, so I went for a glass of pinot noir ($8) which was pedestrian. I was somewhat disappointed with their wine menu as it was leaning heavily towards the white end of things, but I guess it makes sense in regard to a lot of the Thai fish dishes. 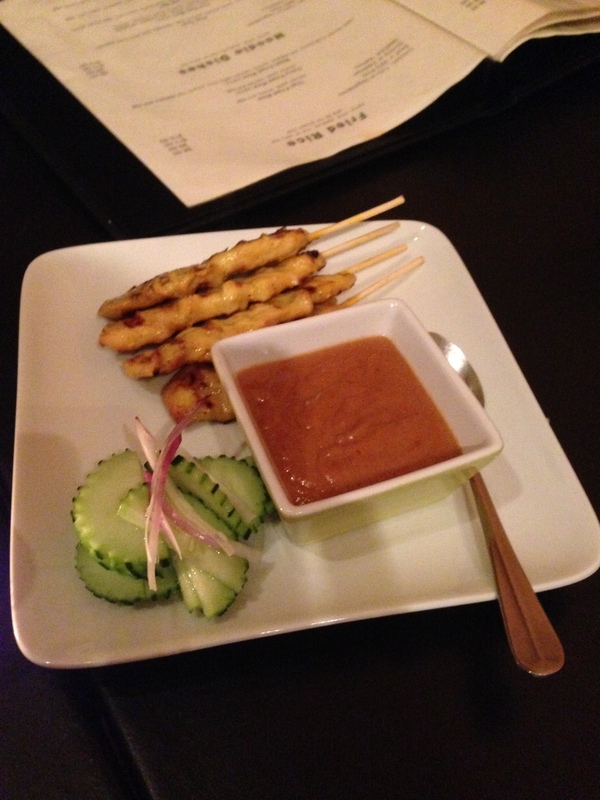 Eventually my friend Mita arrived, and we got chicken satay ($6) for an appetizer. The all-white meat chicken skewers were quite good, and only improved with a peanut sauce that was equally nutty and sweet. They went quickly as we transitioned to the main course. I looked over the fried rice, curries, and specialty plates to eventually plump for a pineapple curry ($13). I had the option of spice level (mild to very hot) along with a choice of roast duck or shrimp. For my spice level, I picked very hot, and our Thai waitress hesitated while writing down my initial order. She then warned me, “It’s not American spicy” to which I responded, “Bring it on!”. It was a dance I’ve done many times sitting down to eat in any sort of ethnic eatery that prides itself in spicy food (read: Mexican, Indian, Korean etc.). Naturally, European cuisine and those from European stock are not known for being well acquainted for heavily seasoned and spiced food, but luckily I got a taste for fire from my dad. Must be the hot Sicilian blood that doesn’t make the peppers seem too bad. The bowl of steaming curry came out with a side of rice to possibly nullify the inferno to come. It didn’t start off too well as I proceeded to scoop up what I thought was a cooked tomato slice, and it ended up being a cherry tomato that burst in my mouth like a shell full of napalm. Even though my mouth was scalded, I sallied forth to actually try the curry once it cooled down. I found large chunks of duck, green and red peppers, and an apricot yellow broth with specks of red floating on the surface like pieces of spicy algae. It was a rich curry in the sense that I could taste the coconut milk with each spoonful, and the meat was very rich with an excellent fat to meat ratio. As for the spiciness, it was roughly a jalapeno level. Our waitress came by with a big smile seeing if my tongue was liquefied yet, and I informed her that it was barely even making me sweat. Clearly they pulled punches for me even though I specified to have it as hot as possible. She then offered more Thai chili peppers which I appreciated. They came out quickly, and I proceeded to dump them all in my curry. It ratcheted the heat index up from a 70 degree day to maybe a typical summer in Phoenix or the equivalent of a light habanero flavor. I enjoyed the curry down to the last drop, and my waitress was so impressed that she didn’t charge me for my wine. Lucky for me I have a lead stomach. We finished our food and was once again hassled by our waitress to pay our bill as they were closing. The owner though was quite cordial as he showered us with after dinner candies while walking out the door. 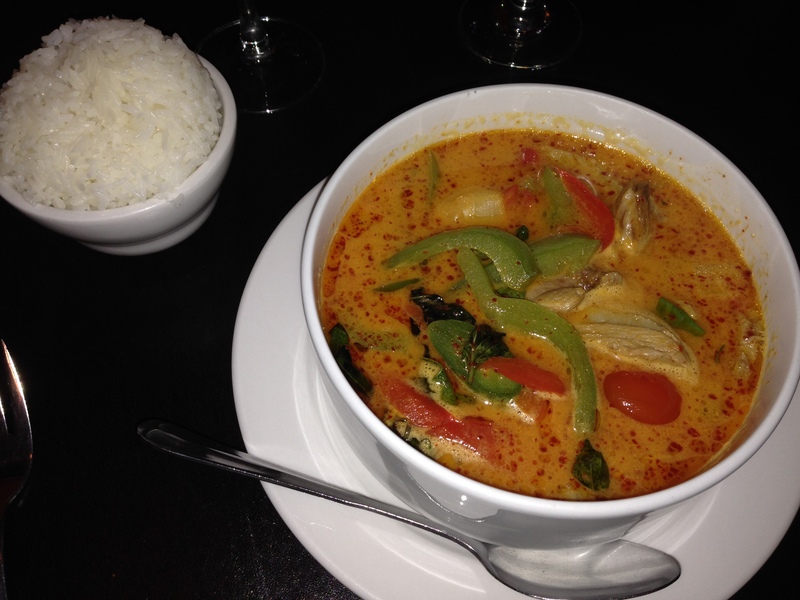 Posted in Southeast/Southern Asia Cuisine, Thai and tagged chicken, curry, duck, fried rice, peanut, pepper, satay, sauce, soup, spicy, Thai, wine. Bookmark the permalink. Good recommendation for the restaurant as well, girl! I thoroughly enjoyed it as you read.